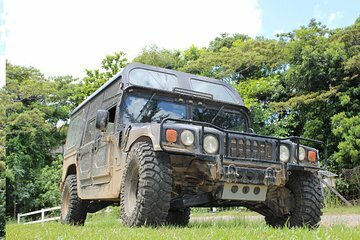 Explore the the lush tropical rainforest near Cairns in a rugged Hummer 4WD vehicle that can handle rough terrain where other vehicles falter. Enjoy a thrilling ride with an experienced driver-guide who zooms across creeks, rumbles up steep hills and cruises through orchards. Keep your camera handy for views of the rainforest and a close up with a cassowary, the tall and colorful native Australian bird. Choose either a morning or afternoon half-day tour that includes hotel pickup and drop-off in Cairns. We did thoroughly enjoy the V8 hummer experience in the rainforest....but...when I booked I envisaged the half day being at least 3-4 hours in the hummer doing 4W driving. Instead...we were picked up at the hotel and went and practised throwing boomerangs in a park for half an hour, it was a half hour drive to get there and back, then during the tour we had to stop several times and pick and sample fruit and tasting, see a distillery, and then we had to look at some trees, which was interesting but not associated with the 4WD experience. In total we were probably only in the hummer for just under 1 hour with all the stop starting at different points. If I had booked a half day 4WD on Frazer Island at least I know it is a half day of 4W driving activity in rough terrain. It was nice that you threw in the other educational rainforest experiences, but when you have the idea of a half day of 4W driving that is what you expect. Perhaps you should advertise a choice of either 4Wdriving or the additional education experience. Don't get me wrong, I think you are onto something, but need to advertise accordingly so we get what we are paying for at 125 for half a day 4WD experience only.